Visceral leishmaniasis is a disease which kills tens of thousands of people every year, mainly among the poorest in the world. The disease is caused by a parasite, which is spread through the bite of infected sandflies. People infected with the disease suffer fever, weight loss and anaemia, and the disease is typically fatal unless treated. The World Health Organisation (WHO) estimates that over 600 million people are at risk of visceral leishmaniasis. It is estimated that there are 50,000–90,000 new cases per year, giving rise to 20,000 to 40,000 deaths annually. The current available drugs have limitations and are not ideal for use in resource-poor settings, resulting in a clear need for new and improved treatments to address this significant unmet medical need. The DDU, GSK Global Health Research and Development in Tres Cantos and Wellcome have been working together since 2011, to discover new preclinical candidate drugs for visceral leishmaniasis and Chagas disease. 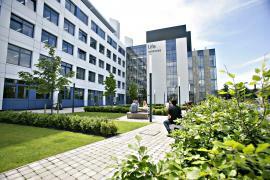 The Drug Discovery Unit at Dundee (DDU) and GSK share a strong commitment on neglected diseases. The collaboration between the institutions is well aligned with the leading NGO organisation DNDi (Drugs for Neglected Diseases intiative).